We, at Aspirinox Alloy Inc, export, and manufacture SS 310 Buttweld Fittings with excellent mechanical properties and in proper condition. 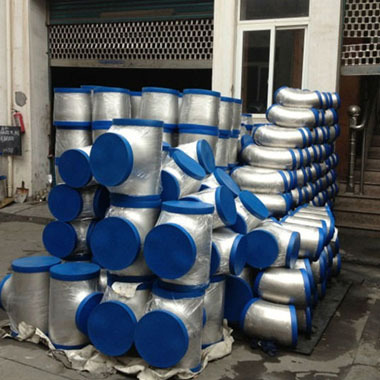 Chemically composed of Phosphorus, Nickel, sulfur, and chromium, it’s used in hydraulic pipes, gas pipes, structure pipes, pneumatic connections and Chemical fertilizer pipes. These Stainless Steel 310 Buttweld Fittings composition gives higher resistance towards corrosion to these fittings and can be used in electrical as well as mechanical engineering. We also provide other varieties of SS 310 Buttweld Fittings such as SS 310 Elbow, SS 310 Reducing Elbow, SS 310 Tee, SS 310 Crosses and SS 310 Reducers etc. These SS 310 Seamless Buttweld Fittings are manufactured by our skilled team of professionals in accordance with the international standards using the finest raw materials, provided by the reputed vendors of the market. By utilizing the latest machines and advanced technology, we bring forth precision engineered SS 310 Welded Buttweld Fittings that are flawless in terms of quality, durability, and performance. We have them at different grades, shapes, and sizes as they are widely used in sugar mills, pumps, petrochemical industries and even construction industry. Special care is given to the packaging of the products so there’s no damage while transporting it to you. The 310 Stainless Steel buttweld fittings have low Carbon and high Nickel chromium, hence providing high resistance to hydrogen sulfide attacks. They also have high creep resistance due to fine grain structure. Contact us to get it at an affordable price and to get the most flawless services. Specifications for 310 Stainless Steel Buttweld Fittings. If any specification is not mentioned here, please use the contact button for quick quote. Contact us or click on the below button to request a latest 310 Stainless Steel Buttweld Fittings price list. Aspirinox Alloys INC is dedicated to providing the world-class 310 Stainless Steel Buttweld Fittings that cater to all your demands at very competitive rates.